Dear Gorumet Girl, you may want to sit down because I am going to suggest something radical. Comfortable? Good. Here's the deal, most GF and grain free breads are disappointingly dense, and once you give up wheat you don't want to eat as much so getting all the way through a sandwich can be a task. I think part of the problem is that we keep trying to make conventional loaves in imitation of the yeast breads of yesteryear. This must be just habit on our parts, because the results are so often brick-like and not as palateable as we'd hoped. 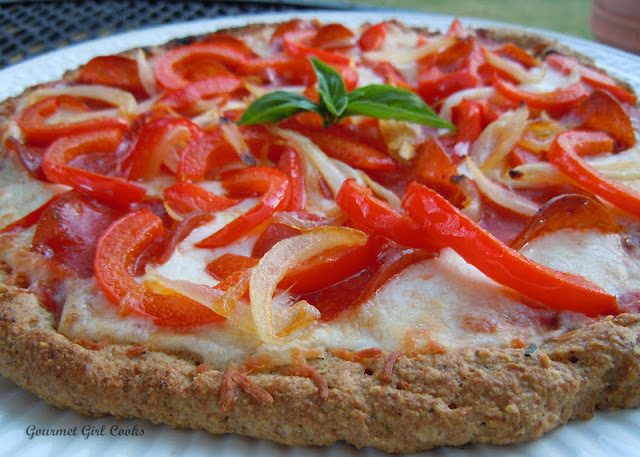 Anyways, I've tried your flaxseed crust and this thin crispy crust on another fine blog - http://www.annemariecain.com/recipe-review-grain-free-pizza/ - and now enjoy the world of pizza again. But your flaxseed crust, which you said rightly reminds you of Boboli storebought, I think would be an excellent candidate for sandwich bread conversion. I propose to spread this out and bake it to desired done-ness, then roller-cut it into sandwich-sized squares and go to town. What I am saying is that if we abandon the loaf pan and go the flatbread route, we're actually working with the poperties of our ingredients and not against them. It is easier for the bread to rise laid out flat because it is not also pushing against the four sides of the pan as it pushes up. I hypothesize that this is the reason GF loaves are so dense. The bread is pushing against itself. But in the flatbread scenario, the bread is free to rise straight up without the interference of the pan or the pressure of the dough mass itself. Which as you know is substantial and heavy. So this is my theory, and I hope it inspires you like you've been inspiring us. I intend to try it later next week when I have some free time and will report back. I am pretty sure that this is a viable path for more acceptable bread. I don't care if it looks like bread or cuts like bread, I just want it to FEEL like bread, and hold together for sandwiches, burgers and dogs. So consider this new (yet so old as to be biblical) approach to bread as you go forward. And THANK YOU for the awesome blog. Thanks again for this wonderful adaptation! Your blog has been very inspirational - I love the way you write about the food you prepare. I've always liked to prepare food, but have never felt great at it. Your beautiful recipes have given me a lot of confidence! Wheat free living has been an eye-opener on so many levels. Lovved this turned out great. Because I do not eat eggs I used 1tbsp of chia seeds mixed with 1/4 c water to make an egg substitute and turned out great. I too will use this as a replacement bread for sandwiches. choThank you for this recipe. We enjoyed it! I feel indebted to you and every one else who is willing to jump in there and not only create these "new recipes"
but to also share them with others. My husband just told me to tell you It was GOOD. Really Good. So you go girl! We are watching, waiting and thankful. Tried this recipe tonight and loved it. Thanks for sharing your love for cooking. It has helped me stay wheat free and happy! I made this last night; very tasty!! Will definitely make it again as both a sandwich bread and pizza crust. 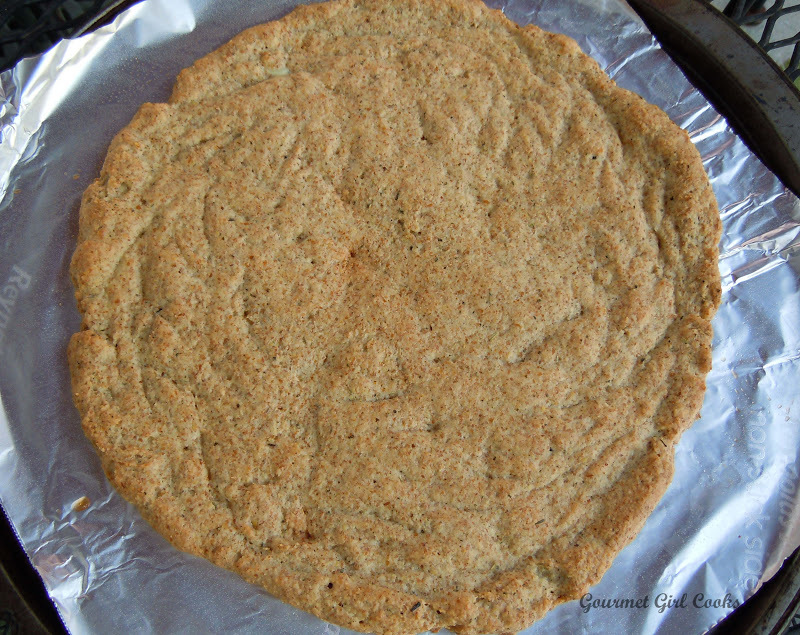 I am watching my carb intake due my sugar levels being a little wacky; have always loved flax seed and now I am entering the world of almond flour...who knew there were so many awesome recipes out there that are healthy, tasty and low-carb?? Thanks for the recipe! I'm curious -- are you adding cheese to this for flavor or to help hold it together? Have you tried to freeze the crust after the first baking and before you put your toppings on? Thanks so much for this great recipe! 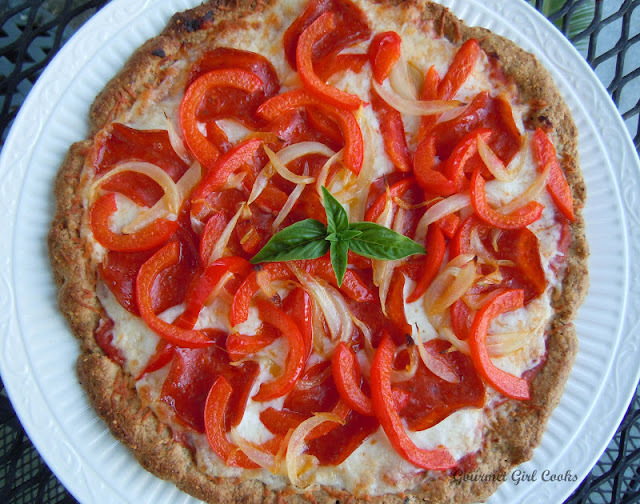 The one thing my husband has been missing since we went wheat/grain free is pizza. Tried this tonight and doubled it to make it more of a pizza shop size. Topped with turkey italian sausge, onions, jalapenos and mushrooms plus mozzarella. We loved it! Love this recipe and I've come back to it so many times! I'm on the 21DSD now and here I am again, printing off your recipe and making my grocery list. Just wanted to say thank you!